Last month saw the biggest fall in five years in people visiting stores during February, according to the British Retail Consortium and Springboard. Footfall among shoppers fell by 2% year-on-year across High Streets, retail parks and shopping centres. It marked the fifteenth month in a row of falls, with Northern Ireland the only part of the UK to buck the trend. Diane Wehrle, insights director, said the overall decline came despite unusually warm weather in February. Ms Wehrle added: "The record temperatures only occurred in the final week of the month, when footfall rose by 2.5% compared with drops in each of the preceding three weeks, averaging 3.6%. "Indeed, the balmy conditions certainly helped High Streets where footfall rose by 4.5% in the last week of the month, compared with an average drop of 4.1% in the preceding three weeks." In Scotland, footfall fell by 3.8% year-on-year, while in Wales it declined by 2.2%. In England, the South West and the East were among the weakest performing regions, with declines of 3.5% and 3.4%, while London saw a 1.4% fall. Across the UK, High Street footfall fell by 1.9% annually - the seventh straight month of decline. Footfall in retail parks dropped by 0.8%, and shopping centre footfall faltered by 3.4% year-on-year, a deeper decline than last year's fall of 0.9%. 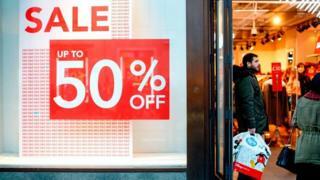 Helen Dickinson, chief executive of the BRC, said: "These figures echo the month's poor retail sales figures, which saw weak growth, particularly in bricks-and-mortar stores. "While real incomes have been rising over the last year, the uncertainty surrounding Brexit appears to be driving a needs-not-wants approach."